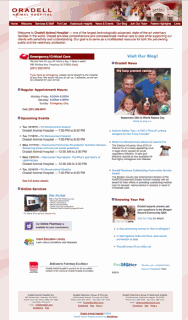 Oradell Animal Hospital of Paramus, New Jersey is one of the largest and best animal and pet care centers in the world. But its website was old and the graphics designer who did their updates was closing her shop and leaving the country. Their marketing director was looking for new ways to connect with their current clients and customer base but didn’t have to budget to do a full redesign of their web site. Recreating the current site’s structure and design in WordPress, adding social sharing and other functionality with plugins and widgets looked like the solution but there would be challenges in the project. There were over 300 html files on the existing site without much organization. A major overhaul of the web site had apparently been done 6 or 7 years ago but the earlier generation of files had not been deleted. Internal links and navigation menus were a mess. A two column front page that pulled post lists from different categories needed to be built and it had to be editable by the client. Templates for other special page types would need to be created. 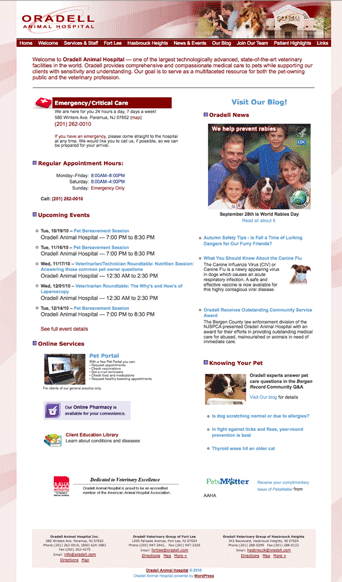 Oradell needed a way to manage their busy calendar of events which included everything from special lectures to pet bereavement group session at multiple locations. A large amount of content had been collected over the years that needed curating and conversion including profiles and pictures of 100 doctors and staff. I would need to duplicate their doctor-popup windows. Lisa Davis, Oradell’s director of marketing and I worked our way through the content sorting the pages into a navigable hierarchy. We played with the front page’s features and layout over the course of the project until it finally looked and felt right. I built a special template for the Services & Staff pages that included a dynamically generated menu of all of the hospital’s departments. Each department’s page is a child page of the Services & Staff page. I installed the WordPress events manager. This is a powerful piece of programming. It’s highly configurable and easy to use but, otoh, required a lot of configuration for Oradell’s requirements. in the content of a page produces a listing of permalinked post titles in the “featured” category. The other choices for the display option are “excerpt” and “post”. These are used throughout the site. Dr. John Dolittle lives in a little town called, Puddleby-on-the-Marsh in a little house on the edge of the town. The house was quite small; but his garden was very large and had a wide lawn and stone seats and weeping-willows hanging over. He is very fond of animals and keeps many kinds of pets. Besides the gold-fish in the pond at the bottom of his garden, he has rabbits in the pantry, white mice in his piano, a squirrel in the linen closet and a hedgehog in the cellar. All in all, I liked working on the new Oradell website. It presented interesting challenges and the people I worked with were wonderful.